Will Virat Kohli be India’s best captain ever? I know. I know. I know. It’s way too early in the day. He has only been captain for 17 Tests. He hasn’t captained against England in England, Australia in Australia and South Africa in South Africa. But I also know from experience that it’s never too early to make a good call. Those good early calls are what legends are made of. They are what separate the men from the boys. They are what reputations are built on. So humour me as I take you on this journey that straddles the past, the present, and the future, of a man who may just be India’s greatest ever captain. Rewind two years, to Adelaide, December 2014. Virat Kohli is captaining India for the first time in place of an injured MS Dhoni. Australia scores a massive 517 runs, with centuries from Warner, Clarke and Smith. India replies with 444, on the back of a century from Kohli, and half centuries from Vijay, Pujara and Rahane. Australia declares at 290 for 5. A lead of 363 runs. 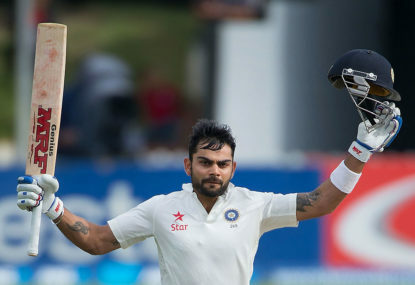 The aggressive, brash Virat Kohli of 2014, accepts the Australian challenge, and decides to go after a precious victory against Australia, in Australia. On the back of a patient 99 from Vijay and a 141 from Kohli himself, India is in sight of a possible win, when with 15 overs and 64 runs to go, Saha gets out, leaving India’s long tail exposed, with Kohli fighting a lone battle at the other end. The Kohli of 2014, decides to take the fight to Australia instead of buckling down for a well deserved draw, and holes out to Marsh trying a mistimed pull of Nathan Lyon. India loses the match, and the series 2-0. Fast forward to Rajkot, November 2016. 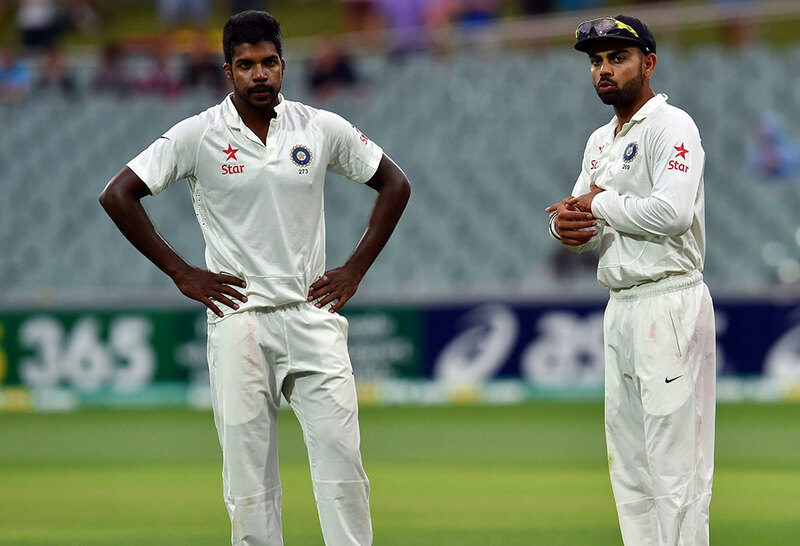 In a virtual rerun of the Adelaide Test, England scores 537, India 488. England leaves India a difficult 310 to get from 49 overs. Kohli is again at the crease, watching the wickets tumble at the other end, but at 71 for 4 in the 23rd over, he decides, this match is not worth losing in going for an improbable win, and buckles down to save the Test. It is however in a manner totally unlike what an Alastair Cook would have done. A man used to chasing down totals, Kohli now has a new challenge, and he decides to enjoy himself, while he goes about facing it. With tremendous presence of mind and a sense of humour, he even appeals for a ball from Ansari the left arm spinner to be called a bouncer for the over. Much to everyone’s amusement, the umpire agrees. With the last few balls to go, and Kohli unbeaten on 49, Cook offers him a draw. Graciously, Kohli accepts. And unlike what Malcolm Knox in his Sydney Morning Herald column would have us believe, televisions across the subcontinent are not switched off as this absorbing Test match is being played out to its nail biting end. From Sydney to Singapore to Kolkata, live discussions are buzzing through the social media airwaves and TV sets are unmuted to capture the drama. This is Test cricket at its best being played out between two very good teams, and two captains eager to prove a point. One playing to save a Test, the other directing his men from short leg, urging them on to take those last few wickets. A clash of two captains, each unwilling to cede an inch. So what’s happened with Kohli in these intervening two years? Well, he has won nine of the 17 Tests he has captained, drawing 6 and losing 2, including the one in Adelaide. He has taken India from seventh in the ICC rankings to the No. 1 position, in a little more than a year. But let’s hold our horses, for he has captained in only 17 Tests, compared to India’s three most successful Test captains: MS Dhoni, Sourav Ganguly and Mohammad Azharuddin, who have a combined 156 Tests under their belts as captain. He is also far from Ganguly’s record of 11 Test wins outside India. Ganguly remains the only Indian captain with a positive win-loss record away from home. But Kohli has already won more Tests as captain than Tiger Pataudi, Sunil Gavaskar and Rahul Dravid, with far few Tests as captain than any of the named. He is also the first cricketer in Test cricket history to have scored centuries in his first three innings as captain. He is also the first Indian Test captain to score not just one, but two double centuries as captain. The trajectory Kohli is on as far as captaincy is concerned is certainly an upward sloping one. He is averaging over 60 in 2016 while leading his team from the front. With nine home Tests to go in the next three months, even five wins will take him to 14 victories and at par with Azharuddin. And that will have been from 26 Tests, still leaving him at a higher than 50 per cent Win ratio, which he currently has today. Ganguly with 43 per cent and Dhoni with 45 per cent are the only captains with a better Win per cent at that level. In fact, this is where a comparison of Test captains gets really interesting. If we look at the records of international captains with more than 25 matches under their belt as captain, there are only 11 who have a Win per cent of 50 or higher. And none of them are Indian. Steve Waugh leads the way with an incredible 72 per cent record, followed by Ponting at 62 per cent, Brearley at 58 per cent, and Woodfull, Richards, Shaun Pollock, Taylor, Clarke, Vaughan, Cronje and Ian Chappell. Interestingly, except Richards, the average tenure of captaincy of each of them was between four and five years. By this yardstick, Kohli has another three years or so to work his magic, to continue what he is doing, keep learning and improving as he is. With his obsession with fitness, perhaps longer. He shows all the early signs of being a successful captain in the long run – a razor sharp cricketing brain, a mature head on his shoulders, an attitude that gives no quarters away, and a huge desire to win, every time he walks out to toss. This is a different Virat Kohli. A mature Virat Kohli. A captain who is India’s present. And its future. The aggression still persists, but the brashness is gone. The weight of 1.3 billion people weighs lightly on his broad young shoulders, as he sets out to fulfil their dreams. And to be the best captain India has ever had.